Strata or stratta is a layered casserole dishes founded in American cuisine. Strata is most commonly found among other prepared brunch dishes or recipes. Strata is compared to a quiche or frittata, made from a mixture which mainly consists of bread, eggs and cheese, including cream cheese. Some bakers or cooks have even prepared strata with meat or vegetables. Now for our featured recipe: Apple Whole Wheat Bread Strata with Cream Cheese Glaze, and here is what you will need. Line the bottom of a 9 x 9-inch glass or ceramic baking dish with organic parchment paper, and brush the sides with organic unsalted butter. Unpack the bread, and use all of the slices less the ends. Cut the crust off each piece, and set the crusts aside. Line the bottom of the prepared baking dish with half of the crust-less bread. Layer apple slices on top of bread, and layer remaining bread slices over the apple. In a medium bowl, mix the eggs, milk, brown sugar, cinnamon, and nutmeg. Whisk until well incorporated. Pour the egg mixture over the apples and bread. Cover the baking dish with aluminum foil, and refrigerate a 1 to 2 hours, or longer (If you wish you can remove strata after refrigerated time, leaving foil over dish, and let set for 30 minutes before baking). If you haven’t already done so, remove strata from the refrigerator, and place into heated oven with foil still over the dish. Bake for 35 minutes, if the strata was room temperature or for 45 minutes if coming straight from the refrigerator. Remove foil, and bake for additional 15 minutes. In a small sauce pot over medium heat, mix cream cheese, honey, milk, and vanilla. Continue to stir until cheese is melted and glaze is formed. Pour glaze over warmed strata. Spread glaze with back of a wooden spoon until evenly distributed. Let sit 10 minutes. 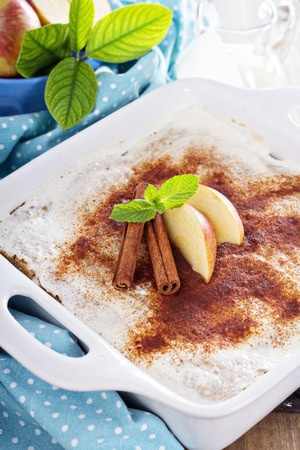 Sprinkle with organic powered cinnamon, and serve with apple slices and blueberries if desired. 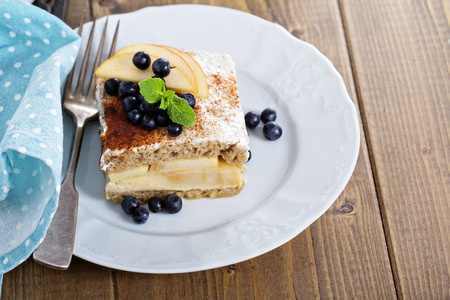 This entry was posted in Brunch or Lunch, Dessert and tagged Almond, American cuisine, apple slices, baking dish, Baking powder, Butter, Casserole, Cream cheese, Flour, frittata, Ice cream, Milk, Olive oil, Powdered sugar, quiche, strata, Tablespoon, Teaspoon, Vanilla extract, whole grain bread. Bookmark the permalink. Thanks Roger 😃 and always glad you take the time to stop by! Something different. Sounds like a great combo of flavors though. Hey sorry RoSy, I missed this comment. Yes this recipe makes for a good brunch dessert.